A Happy Healthy Mummy: Are you ready to raw? Who doesn't like fresh veggies? 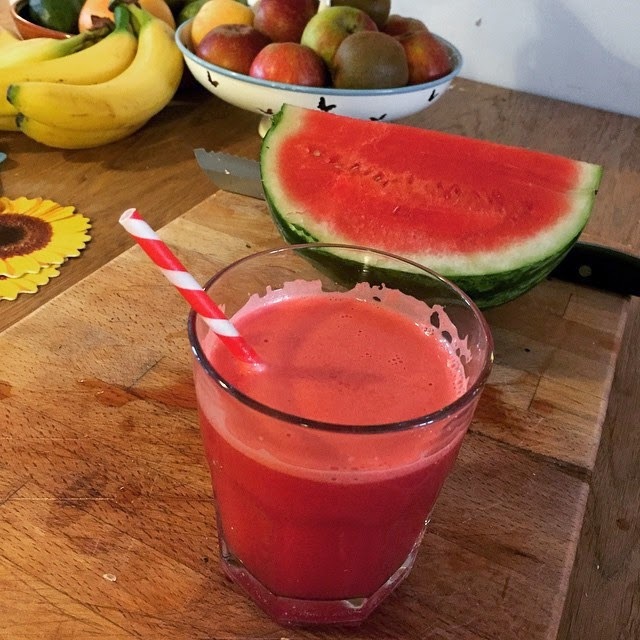 Spurred on by my addiction to Nakd bars, and my menu boredom that kicks in every now and again, I recently decided to dabble with some raw food recipes. Officially 'raw food' is a term that covers food that has not been heated above 48℃. Many proponents of this way of eating believe that foods cooked above this temperature have lost their enzymes and nutritional value and that food in its natural state is free from the hidden nasties that lurk in processed food. Typically on a raw diet you'd be eating fruit and veg and nuts and seeds, but raw foodies also use raw nut butters and milks, cold pressed oils, seaweed, fermented foods (like miso) and vinegars and foods cured in vinegars. So how do you get started? In truth, we all eat some raw food regularly anyway. Hummus and veggies is a good example (you can get official raw tahini) - who doesn't like a carrot baton? Fresh juice is another. Personally I've always preferred green veg uncooked - and regularly feed my kids raw peas, mange tout and green beans as a snack. And as a child myself I would quite often refuse cooked veg but eat it raw, so there's definitely some natural attraction there for me. I also feel a sense of personal failure when I open packaged food, because while it might be quick and easy, it's naive to think that food manufacturers have anything but their own wallets in mind and, put simply, crap food full of chemicals is cheap to make. So I began scouring the internet for recipes and treated myself to the Raw & Simple book post-Xmas. My juicer and food processor have both seen plenty of action in the last few weeks - as there tends to be more prepping to replace the cooking. Further down the line I'm gunning for a 'spiralizer' so I can make noodles out of veg like courgette (the American's call them 'zoodles' from zucchini!) and squash - and the next step is a dehydrator, which some use to make raw crackers, breads and biscuits, but can also be used to dry fruit and nuts, make fruit 'leather' and incubating yoghurt! It's a whole new world out there! I'm happy to eat them all myself! 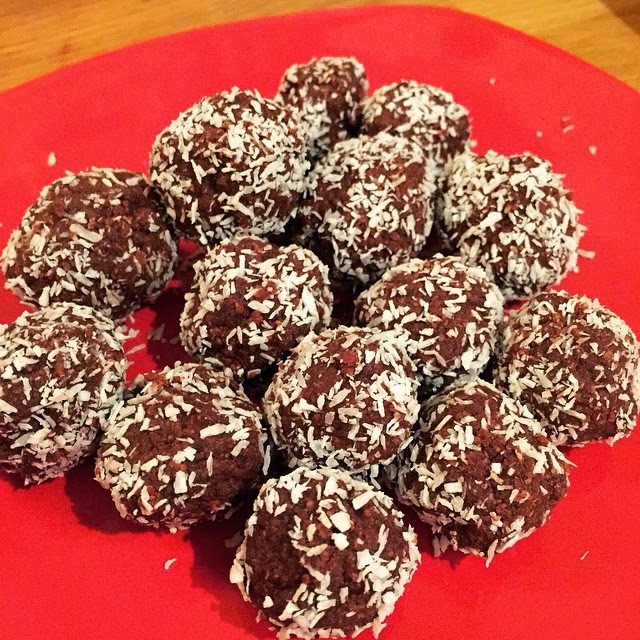 My first dalliance with raw food was making some chocolate almond balls following this recipe - simple once I'd realised 'almond meal' is in fact ground almond!! They were tasty and in the style of those Nakd bars I can't resist, the kids weren't so keen on them, which I suspect may be the desiccated coconut. I also ad-libbed with some veggie spring rolls, hacking a few recipes together to fit with what I had to hand. Rice paper sheets were easy to find at the supermarket - and you just soak them quickly in warm water and use them to wrap some thinly sliced veggies, then use a dipping sauce when you come to eat them (raw options could be one based on a raw nut butter or apple cider vinegar). Delicious - and a darn sight healthier than popping off to the take away! 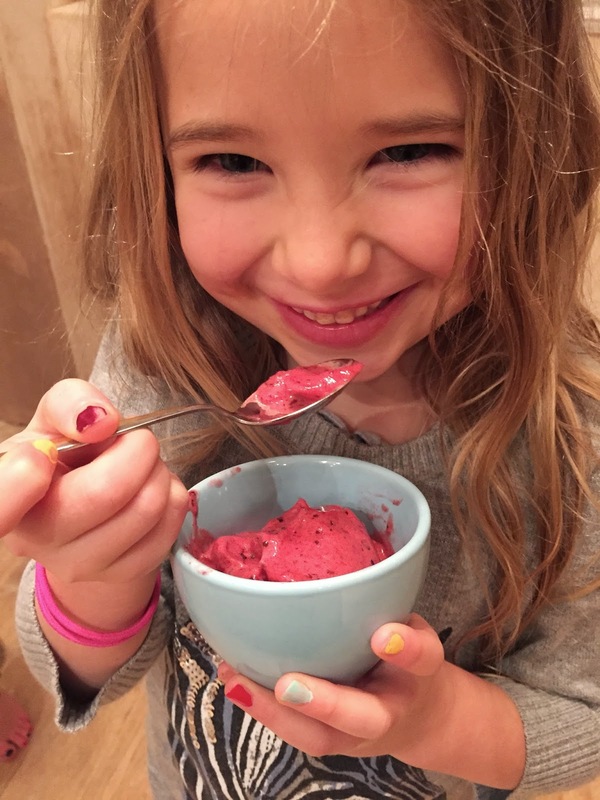 Over the weekend, my kids have been sampling more raw recipes or me. To get them onside I used the recipe for oatmeal walnut raisin cookies from Raw & Simple. To begin you process walnuts until they almost form a butter, then add dates to form a dough - and then add the other ingredients. To make the cookies you roll your mixture into little balls and flatten - simple! You can put them in the fridge for a soft version - or the freezer (if you can wait...) for a harder cookie. The result is amazing - they taste like lovely indulgent biscuits - and yet there's no saturated fat or added sugar. This is certainly something you could use as a post-school snack. Vegan ice cream - a form of witchcraft? Ultimately though my children were completely won over by 'vegan' ice cream - versions of something I'd seen on several websites and in several books. This necessitated some planning - namely buying some bananas - waiting unit they were very ripe (not easy, I had to guard them from hungry tummies), then chopping them into chunks to freeze. Once I had my frozen banana chunks I was able to blitz them with equal amounts of frozen fruit. It took a while for my very basic food processor to work the magic but after a while you have created a heavenly dessert from just two fruity ingredients. My efforts were very creamy - so quite like sorbet - and would work equally well for kids and adults. It goes without saying you can add other things to the frozen banana - raw chocolate powder or peanut butter for example, just vanilla essence, or even process the banana alone. It's basically witchcraft. 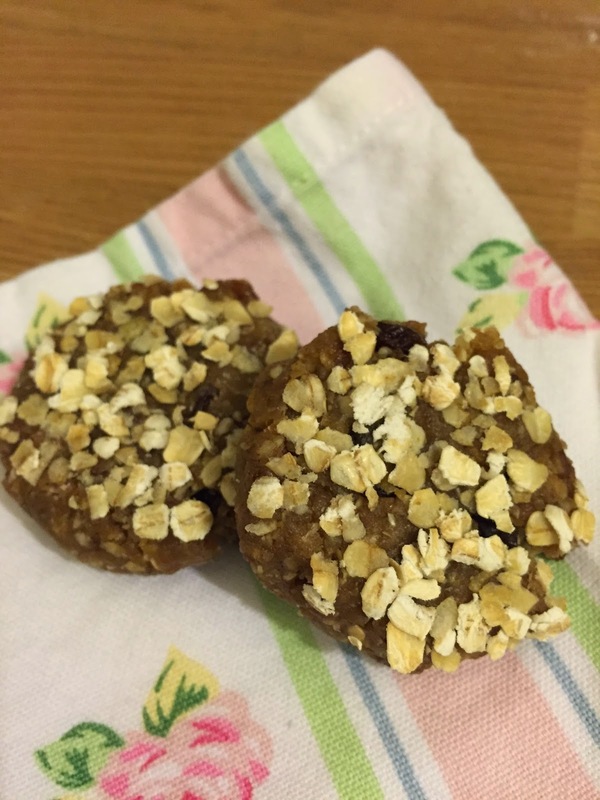 Not that all raw food recipes revolve around snacking and desserts of course! There's many a main meal in the Raw & Simple book, from corn chowder and cauliflower smash to tacos, noodles and chilli. And if you can't bear to eat some foods cold, there's instructions on when and how to warm the dishes through. 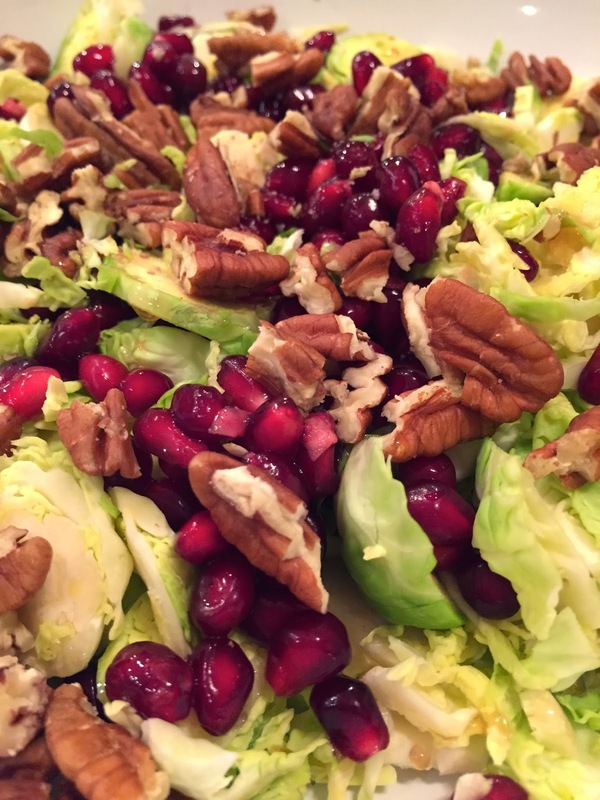 I also had a lovely salad made with brussels sprouts, pecans and pomegranate seeds this weekend. It was a totally new way for me to eat sprouts I can tell you - and yet tasty and easy (what more could you ask for!). I'm going to keep experimenting with the raw food recipes - it's always a bonus to find new ways to eat familiar foods. And extra exciting if you can produce something tasty and nutritious in a flash! There's also still a lot for me to learn - about fermented foods for example and less common 'super foods' such as bee pollen and maca. I'll keep you posted! Have you tried raw food recipes? Do any of the dishes above entice you to get your raw on? I'd love your feedback on this way of eating - and if you think you'd like to incorporate it into your lifestyle. Please use the comment box below to get in touch. Not sure I'd be on the right side of copyright law if I published that here!!! Have a look round the Internet for something similar? I thought recipes weren't subject to copyright - you could always give a link to it though. Funnily enough I got the Helmsley + Helmsley cookbook for Xmas so I made my own nut butter the other day! It was actually quite yummy. I got that recently too! I'm trying some out tonight actually. I like this idea you can make pizza base, 'rice' and 'cous cous' out of cauliflower! I like the idea of some raw food recipes but I could never go the whole hog .... working outside for some of the time, especially in winter, you need something hot to come home to. Easier in the summer mind you. Yes, I think a lot of people would want to incorporate just some raw food into their diets. Some of the food can be warmed in a dehydrator though. Just a friendly reminder to add our badge or a link back as this is one of the linkup rules. Thanks so much and hope to see you at the party again next Tuesday! Hi - will do! Have commented on a few of the posts too. Thanks so much, Vanessa Jane! I really appreciate it. Winter skin - what not to do!